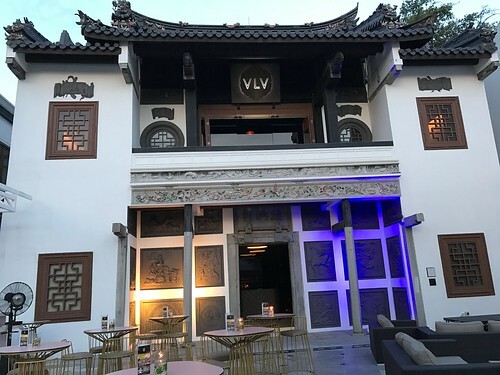 Opened in September 2016, VLV is a multi-concept dining and entertainment venue occupying a beautiful heritage building in Clarke Quay. Built in the 1880s, the "River House" is the oldest building in Clarke Quay. The Teochew-style mansion served as a residence for a Teochew merchant Tan Yeok Nee. The building was converted into a clan hall, then warehouse and left unused. Restored in 1993, it was given a URA Architectural Heritage Award in 1995. The building was converted into a restaurant and club known as The Forbidden City before its current incarnation. I was curious about VLV as Executive Chef Martin Foo was previously from Tong Le Private Dining so I accepted an invitation to a tasting. 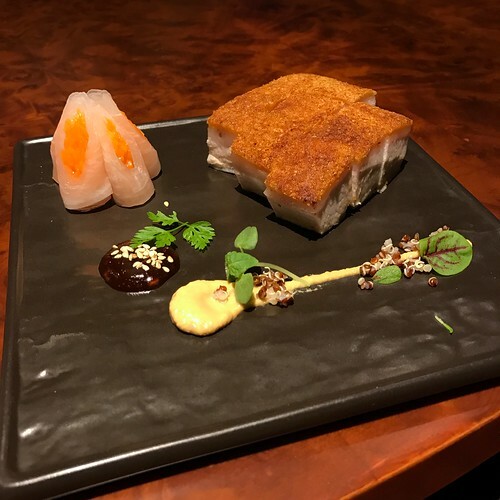 Dinner kicked off with a portion of Crackling Pork Belly (S$18) served with pickled daikon, pickled carrot, Dijon and horseradish mustard as well as togarashi spicy miso. Best eaten quickly to avoid having the crisp crackling cool down too much and lose its crunch. The Canadian Lobster Wanton (S$16 for 4 pieces) with housemade sambal is another signature dish at VLV. 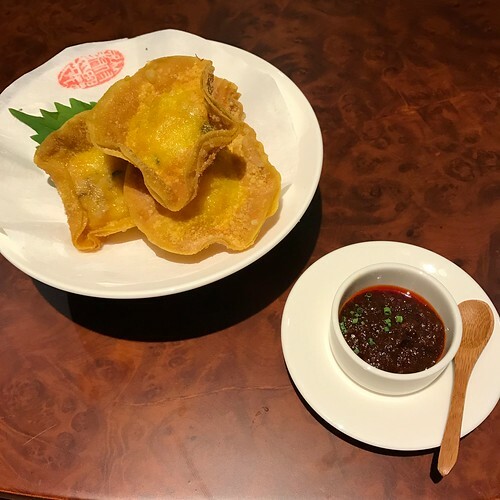 A luxe version of a humble deep-fried wanton, the dumpling was especially flavourful with the addition of shiitake mushrooms and crunchy water chestnuts. 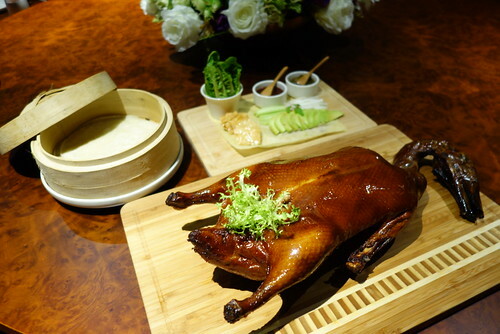 The pièce de résistance that evening, the VLV Peking Duck ($55 half / $110 whole) was an opulent and modern interpretation of the palatial dish. 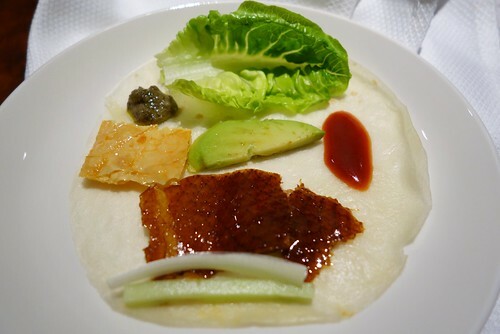 The VLV Peking Duck is served with truffle foie gras paste, avocado, baby leek, Kyuri (Japanese cucumber), hoisin sauce, romaine lettuce, fried beancurd skin, and steamed house-made pancakes. Diners are encouraged to make their own rolls. VLV uses a 45-day old duck to ensure that the skin isn't too thick or fatty. The smoky, crisp and thin layer of roasted duck skin seemed to melt on the tongue along with the cool, buttery slice of avocado and Cognac-infused foie gras sauce. The crisp and flaky deep-fried beancurd skin, crunchy Japanese cucumber slices and refreshing romaine lettuce added texture to the dish. Definitely a MUST-TRY! Traditional Peking Duck second courses are usually (1) fried duck noodles or (2) sauteed diced duck in lettuce cups - at an additional fee. 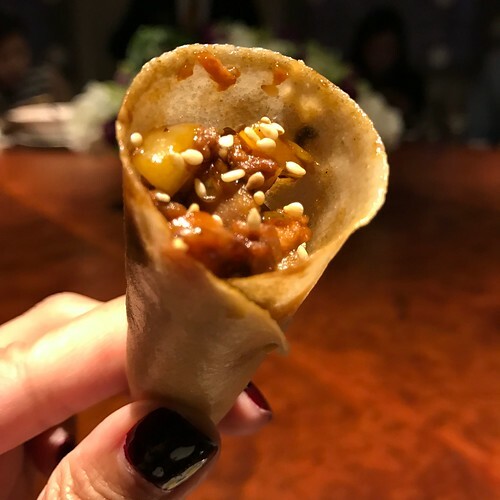 Diners at VLV can choose between (1) Yangnyeom Duck with housemade kimchi or (2) Spicy Duck Cone (6 cones for half a duck & 12 cones for a whole duck) - without any additional fees. 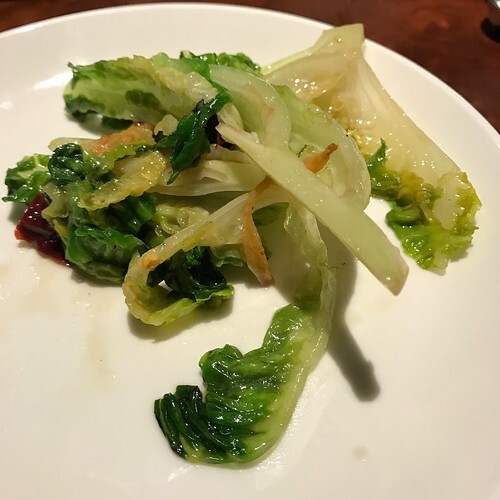 An interesting twist to the usual methods of prepping the second course for the Peking Duck, I preferred the seemingly healthier lettuce cup option to the cone. 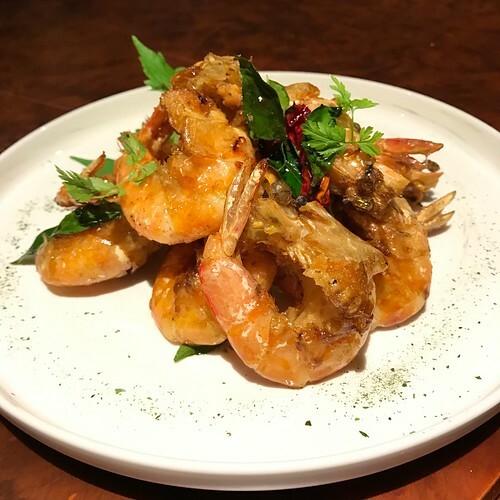 The Premium Soya Prawns (S$36) were excellent! The firm, juicy prawns were cooked over high heat with soy sauce, dried chili, curry leaf and Worcestershire sauce. I loved the "wok hei" ('breath of the wok') and how crisp the prawn shells were. Definitely a Must-Try! A deceptively simple looking dish, the VLV Beggar Chicken (S$58 for 3 - 4 pax, limited quantities daily) is a winner! The mud shell containing the chicken was set alight on a guéridon and a stick used to break the flaming mud shell. The Sakura chicken was wrapped in glass paper and lotus leaf before being baked for four hours. 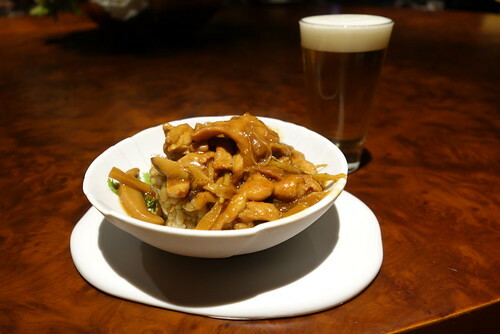 I wished I wasn't feeling so full so I could enjoy the succulent chicken with tender chestnuts, crunchy bamboo shoots, ceps and aged Hua Diao wine served with an interesting side of "rock rice". Manager Vincent Tan told us that the rice was harvested from the mountains in Nepal. The low-carbohydrate wild rice grows at an elevation of about 2,000 - 3,000 metres above sea level. The grains need to be cooked with five times more water than regular rice. I loved the chewy texture of the high-fibre grains. They reminded me of bulgur and quinoa. Smothered with a generous dollop of gravy, I found myself finishing off every grain that was in my bowl. 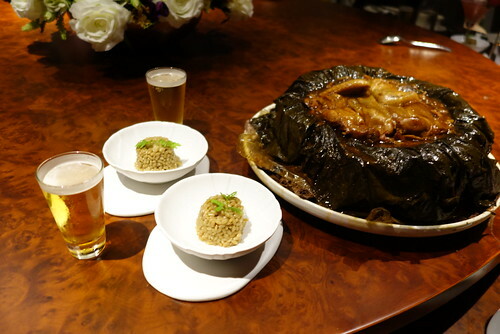 Vincent says that the dish is best paired with a glass of Suntory Beer. With or without the beer, this comfort food dish is definitely a Must-Try! The claypot of Sizzling Romaine Lettuce (S$24) reminded me of some of my meals with Dim Sum Dolly in Hong Kong. Tossed together with dried shrimp and prawn paste in a hot claypot, the romaine lettuce retained a bite while taking on the umami-rich flavours of the seasoning. 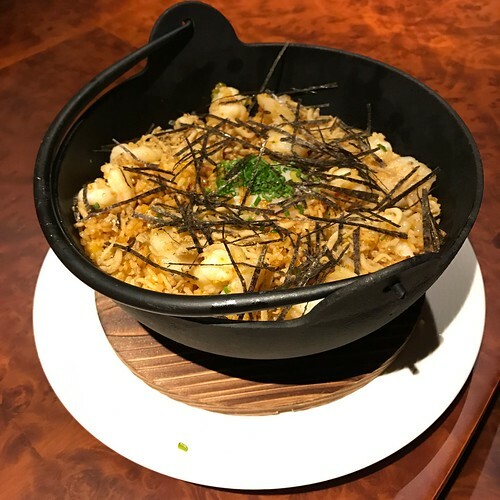 I wasn't crazy about the Kimchi Seafood Fried Rice (S$28) though it's listed as a signature dish.I thought the fried rice could do with more kimchi while the 63°C egg that topped it was just a little overdone. Just as we wondered how we'd find room for desserts, plates of 'Luo Han' Jelly (S$12) and 'Or Nee' (S$12) arrived. The herbal 'Luo Han' herbal jelly was sweetened with longan sorbet, Chinese pear and young coconut. 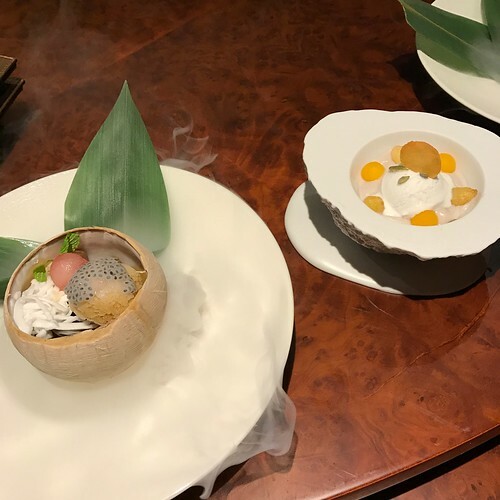 I preferred the signature 'Or Nee', a creamy sweetened taro paste with gingko nuts, coconut ice-cream and salsify. Stay tuned for my review of the Weekend Dim Sum Brunch Buffet. PS: Thank you, VLV and Katherine Sng, for the hospitality.